"Brilliant," "fabulous," and "inspiring" were some of the adjectives heard from South Africans about the symposium; "one of the best ever" was the consensus of the IHS Advisory Council, whose members have attended many previous symposiiums. "This workshop will take a special place in IHS history," stated Bruno Schneider, host of the 2007 symposium and one of the this year's stars. "It was truly international." Andre Valentine, part-time university student, and Roger Small and Paul Wynand, both members of the South African Army Band, all agreed that it was exciting to see how horn players can play solos; they never knew how exciting the literature could be. "We can see the technical ability that can be achieved if you practice a lot," added Andre. Cathy Kilroe-Smith (a South African studying horn at the University of Georgia) and her friend Alice Thomson (Durban) thought it was "great to have the symposium in South Africa." They also used the word "inspiring." Professors Erik Albertyn (University of Port Elizabeth) and David Scarr (Rhodes University, Grahamstown) at first both opposed bringing the symposium to South Africa this year. They thought more time was needed to secure funding and to plan, that not enough local horn players were available for it to be successful, and that many local students would not be able to attend becausse it was their term time. 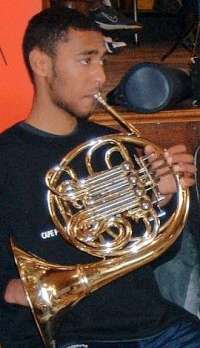 Aftger Steven Horwood secured the bid, however, and eventually the South African Horn Society took over the organization, they supported the effort wholeheartedly. "It will be easier to recruit with this success," said Erik. David has been doing much administrative work in recent years, but now is playing more. "The symposiium has been simply uplifting," he said. They used to have regional workshops, and now the newly-formed South African Horn Society is resolved to have an annual national workshop. David has a violist colleague who attended all the concerts and pronounced them "absolutely fabulous." David also encouraged a euphonium student to attend. He felt that the symposium should have been marketed to all musicians because of what they could have gained from hearing world-class musicians, no matter what the instrument. Some sessions were devoted to traditional South African music, which entranced the visitors. However, many of the local young people are not interested. Erik sees an opportunity to bring traditional music into the classical arena, to the benefit of both. He commissioned a work for horn choir through the IHS Mier Rimon Commissioning Fund, "Two for Erik" by S. Glasser, that uses kudu horns along with modern orchestral horns. "Bartok and others are a precedent for incorporating folk and vocal music intro instrumental works," Erik contended. "We don't want to go back to isolation between social groups." The outreach program affected many attendees. Pamela Kierman (University of Stellenbosch) organized a day-long tour of schools (see a separate report by Jonathan Stoneman) described as "surprising, but affecting" (Joseph Ognibene, Iceland) and "fascinating" (Rose French, Tempe, AZ). Marshall Sealy, a free-lancer from New York City, put together a horn quintet to play at the schools. Marshall, in fact, raised money at the last minute to attend the symposium, brought a horn to donate, and has applied for a Fullbright grant to teach instrument repair workshops and study South African traditional music. Horns were also donated to the outreach programs by Chris Leuba and Kurt Vallenga, the Swedish Horn Society (presented by Anita Andersson), James and Cora Patterson, and Wallace Easter. Caroline Van Renen, the only horn major at the University of Cape Town, was thrilled to have the symposium in South Africa, although she could not stay for the whole week because of school obligations. "I want to study with these artists," she declared. She plays in the South African Youth Orchestra, which rehearsed for days in July and is soon touring Europe. Among the many highlights, most would agree that the Wednesday evening concert with the Cape Chamber Orchestra stood out. Frank Llyod played the Förster Concerto; Bruno Schneider, Mozart No. 4; Lisa Ford (Gothenburg Symphony Orchestra, Sweden), Larsson's Concertino for Horn and String Orchestra; and finally, a glorious performance of the Haydn Concerto for Two Horns with Bruno and Frank. Listing the works and performers does not do justice to the impeccable, lyrical playing and joyous atmosphere of the event. The symposium was smaller than any for a number of years (about a hundred regisered attendees, with two or three times that many at the evening concerts), but many felt that the smaller numbers lent an air of intimacy that fostered grater interaction between all participants. It was truly a symposium to remember. Marilyn Bone Kloss earned BME and MM degrees in horn at Indiana University, taught public school music, and freelanced. Later she earned a degree in engineering from Northeastern University in Boston while working at Raytheon Company. She now works as a technical writer, plays in a community orchestra, edits a newsletter for hornists in the New England area, is an IHS Area Representative, and has served on the IHS Advisory Council.